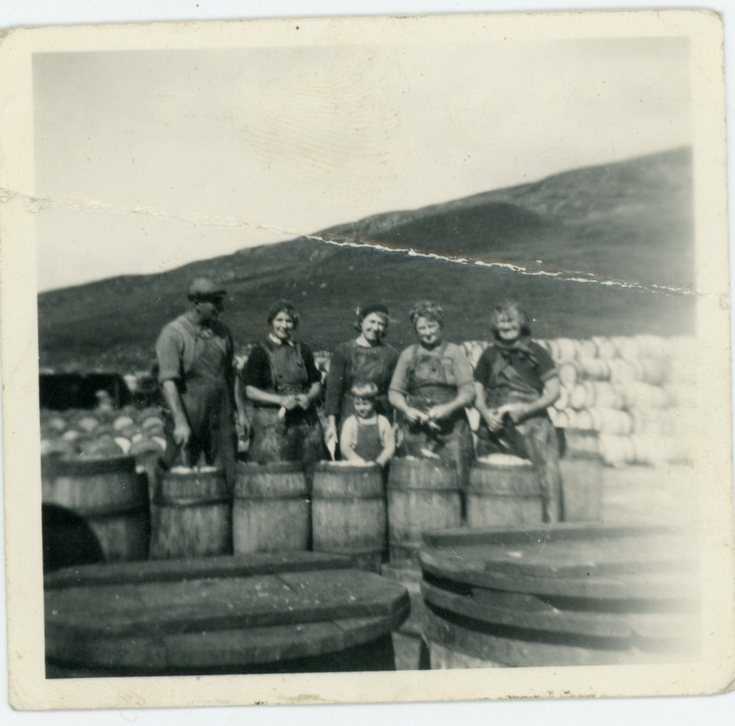 Monochrome photograph of a group of ;Herring Harvesters' packing barrels with a man on the left and a child at centre of the group. Mary Ann Mackay is on the right of the group. Mary Ann Mackay was known in Embo as Mary Ann aigh Chiney. She was calked this after her father Alexander Fraser, who was known as Chiney from having worked with a Chinese trader in his youth. Mary Ann had three daughters, Barrie, Christina and Bella. Christina and Bella feature several times in this series of photos relating to herring packers. I knew all of them in my childhood in Embo as they were closely related to my mother, another Mary Ann Mackay who was known in Embo as Mary Ann aigh Dannagh to distinguish her from the many other Mary Anns in the village.